There are four Curves graphs (formerly called “Over Life” graphs) in Trapcode Particular. The controls are: Color over Life, Size over Life, Opacity over Life, and Blend Mode over Life. These controls appear in both the main Particle group and in the Aux System group to let you set the controls separately for each particle group. For example, The Particle group has a control for the main particles Color over Life values, while the Aux System group has an identical control that sets only the the Aux particles Color over Life values. For Size, Opacity, and Blend Mode over Life, there is a special graph in the interface that allows you to control these values specifically. This graph has been significantly improved in Particular 2.5, with more tools and features, and a larger size that is easier to see. In each instance of the curve, the controls behave in a similar way. The vertical axis of all curves is used to indicate the amount of an attribute. The horizontal axis is used to determine where those values fall in time, the left side controlling the beginning of the animation, and the right side of the graph controlling the end of the animation. For example, in the Size over Life curve, if we drew a line that started on the bottom left (which indicates a small size value at the beginning of our animation) and ended at the upper right corner (which indicates a large size value at the end of the animation), our particle size would get larger over time. Curves in Particular can now be animated. You can create two completely different Curves, and Particular will interpolate between them over time. 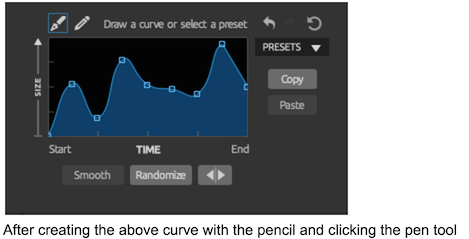 Simply click the stopwatch next to the Curve to record the current shape of the Curve graph, and then animate this as you would any other After Effects property. 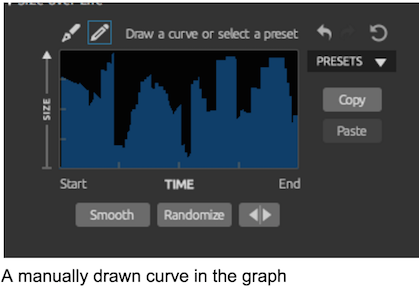 Use the stopwatch to animate the shape of any of the Curve graphs over time. 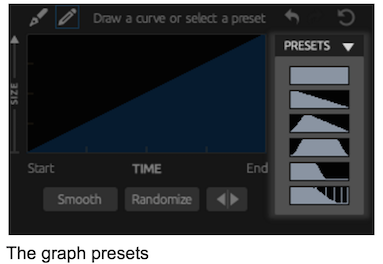 In the upper right corner of the curve interface, you’ll find a presets drop down with many common curve types. 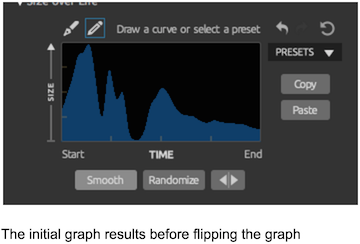 While you get the most control from drawing your own curves in the graph (discussed below), using the curve presets can provide a faster shortcut to common curve shapes, or provide a jumping off point that you can customize with your own drawing. Note that the presets become significantly more powerful when using the other interface controls in the curve (discussed below). the top preset resets the curve, as it sets the attribute to be at full value for the life of the particle. this preset creates a similar effect to preset #5, but the reduction in the middle of the particle’s life is slightly more gradual, and the end of the life has several “spikes” of a high value. This preset is often used for Opacity over Life, as it can create a sparkle right before the particle dies. 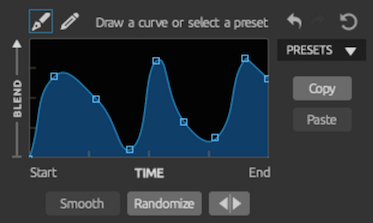 The most powerful way to create curves is to manually draw them in with your mouse in the main curve window. 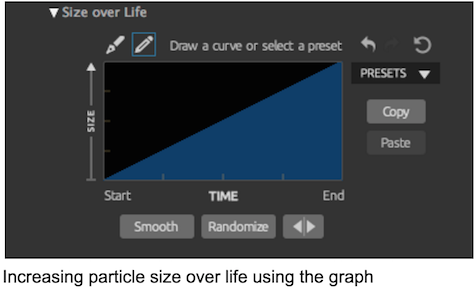 Simply click and drag in the graph area with the pencil tool, and wherever you click will become the value for that attribute at that place in time in the life of the particle. 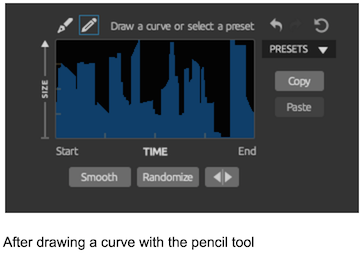 When manually drawing curves, you now have two tools: a pencil (default), and a pen. The pencil allows you to draw the path as you wouldd like. The pen tool allows you to set bezier control points on a curve, and then adjust those points to achieve the desired curve in the graph. 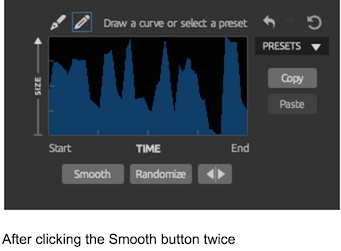 Note that simply selecting the pen tool will also instantly apply a significant amount of smoothing to your curve. These tools can also be used in tandem. For example, a curve can be quickly drawn manually with the pencil, and then by clicking the pen tool, the rough curve becomes smoother and easier to adjust. There are a host of tools to assist you in creating the ideal curve. 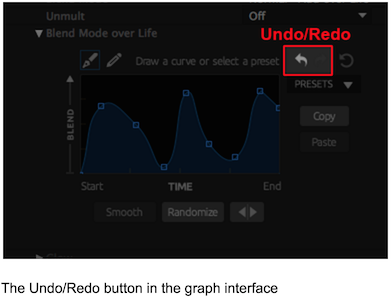 In the upper right hand corner of the graph, the left-facing arrow allows you to undo the last action performed in the curve. After undoing an action, the arrow will face to the right and will allow you to redo the action just undone. In the far right corner of the graph is the circular arrow, which is the Reset button. This button allows you to reset the curve control to get a fresh start. 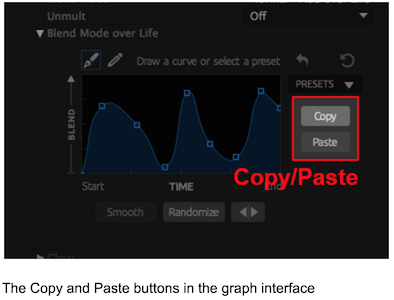 The right side of the interface has Copy and Paste buttons that you can use to mimic behaviors in various curves throughout Particular, and even in other instances of Particular in other compositions in After Effects. Simply click the Copy button, and then in another curve, click the Paste button. 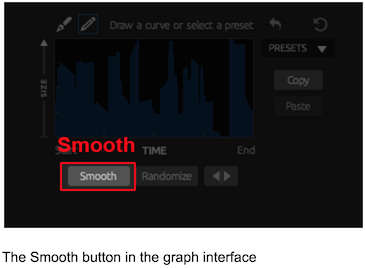 If you are using the pencil, you can click the smooth button to smooth out your results. 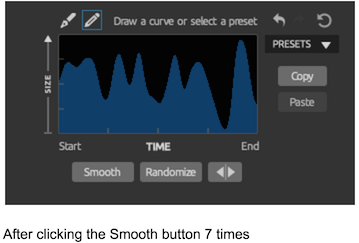 This feature is gradually iterative, meaning that each time you click it, the curve result gets smoothed slightly. Next to the Smooth button is the Randomize button. This usually creates an extremely random result in the curve that would typically be very difficult to create manually. 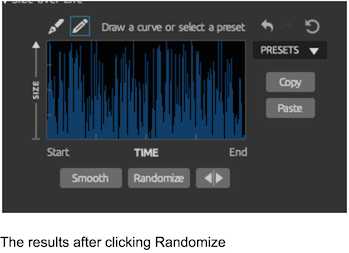 To the right of the Randomize button, we find the Flip Graph button. 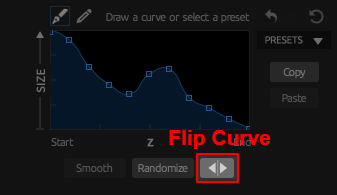 By clicking the Flip Curve button, the curve is flipped along the horizontal axis. This causes the results from the birth and death of the particle to be reversed. The gradient control defines color variation over a particle's life. 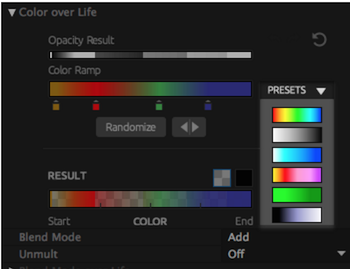 This control is active when the Set Color popup is set to Random from Gradient or Color Over Life. 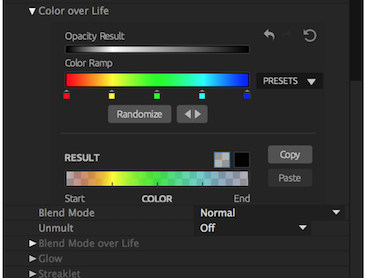 The Color Over Life gradient has four control areas for setting the color on the gradient, choosing a preset and randomizing or reversing the gradient. An Opacity indicator bar that is directly related to the Opacity Over Life controls. It will appear a solid color if the Opacity Over Life control is set to a constant curve. If the Opacity over Life has a custom curve, such a for example a linearly decreasing opacity, then the bar will show a gradient from white to black indicating that the alpha value of the particle is decreasing over time in relation to the colors on the gradient result bar. Note that the Opacity Result section in the Color over Life area is only a reference, and not something that can be adjusted in this section. Color Swatches: To add a color swatch, click in the area just below the gradient (dotted in the image above). The box will initially get the color the gradient shows at that position. Change, move or delete a color swatch: To change the color of a swatch, double-click it. Double-clicking the swatch will bring up the Adobe color picker (new in 2.0), where you can set the color for the swatch. To move a swatch, click and drag it sideways along the gradient. To delete a swatch, click and drag it downwards away from the gradient bar. 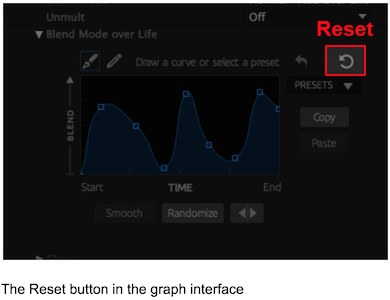 Preset gradients on right side of chart: To select one of the gradient presets, click it one of the buttons. This will immediately replace the current gradient. You can NOT undo this operation. Random Command button: Choosing this button in the command row will change all the boxes' to new colors. If you have five gradient boxes, then all five will get new colors. Flip Command Button All color boxes are flipped around the center, reversing their order. This is useful for changing to the start and end color of the gradient. Copy, Paste Command buttons: These commands copy the gradient to clipboard, and paste the gradient colors from the clipboard. If nothing has been copied, then the Paste button will not appear in the control. This command is useful for moving color gradient value between the main Particle group and the Aux System color group.